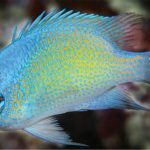 When it comes to damselfishes, the drably colored species are a dime a dozen. There are scores of seemingly identical, interchangeable taxa out there, many of which can be found lurking in the enormous genus Pomacentrus. 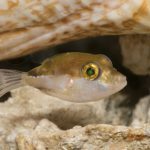 And so it might take a little effort to get excited for the newest addition to the family, Pomacentrus bellipictus, which is, by and large, yet another drab little fish with a chip on its shoulder. 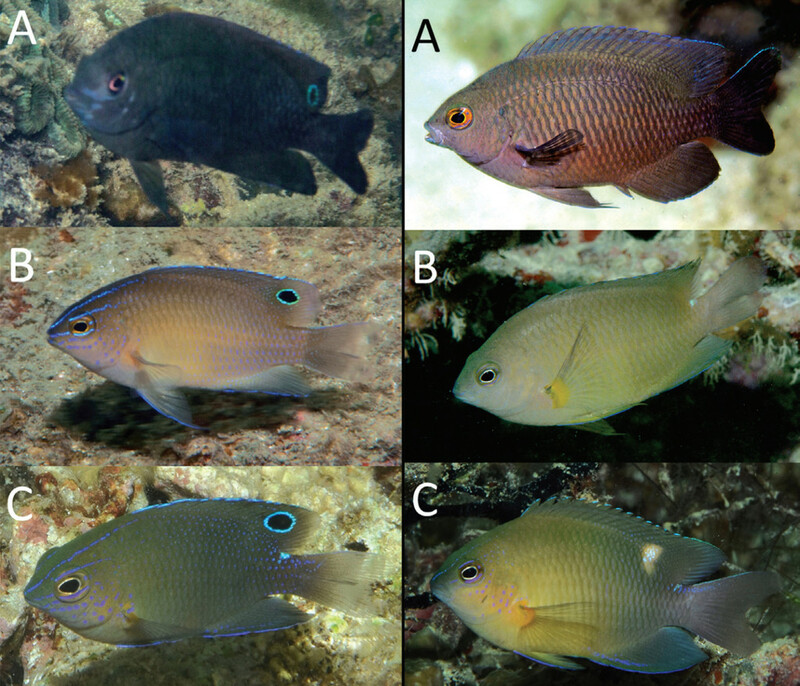 In fact, the authors were so taken by this damselfish’s hostile temperament that they named the species after its unpleasant demeanor, noting “The species is named bellipictus (Latin: war-painted) with reference to its facial coloration and belligerent behaviour towards divers.”. 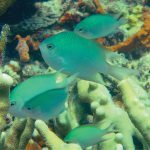 The Bluemouth Damselfish, as it’s been dubbed, has thus far been found in just one particular habitat along one tiny little island in one of the more remote regions of the Coral Triangle. Arguni Island is situated a short distance off the coast of New Guinea’s Fakfak Peninsula, a bit south of the famed Birdshead Peninsula and Raja Ampat Islands. This has turned out to be an area of unusually high endemism, with species like Nursalim Flasherwrasse (Paracheilinus nursalim) and the Triton Epaulette Shark (Hemiscyllium henryi) being found nowhere else. Both of these examples, however, are found on the opposite side of the peninsula, in a coral-rich region known as Triton Bay. However, Arguni Island occurs in a considerably less-hospitable environment near to the outflow of several nameless creeks. The waters here are generally lower in salinity and loaded with silt, and, to find Pomacentrus bellipictus, we have to venture into the shallow, rocky shores of the Fuum Islet. The type locality (and presently the only place in the world that this species is known from) is a small stretch of shaded shoreline that’s no deeper than 2 meters. The authors suggest that this specific habitat—a mix of brackish nearshore waters, often laden with silt and elevated in temperature (31℃), with a substrate more similar to the wave-exposed rocks of an offshore reef—combined with the past isolation of the Fakfak Peninsula has resulted in the speciation of the Bluemouth Damselfish. Interestingly, it coӧccurs with two other species of Pomacentrus which the casual observer could easily confuse. 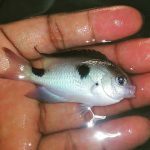 The Fakfak Damselfish (P. fakfakensis) occurs a bit deeper, in the reef flats and the upper edge of the reef slopes, while the evocatively named Brown Damselfish (P. opisthostigma) occurs deeper portions (6-20m) of the reef slope. 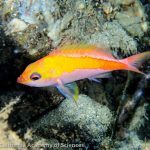 So, while this species might be ugly as sin, it’s an interesting find nonetheless, and one which paints a striking picture about the many disparate forces that work to create new species in the Coral Triangle. 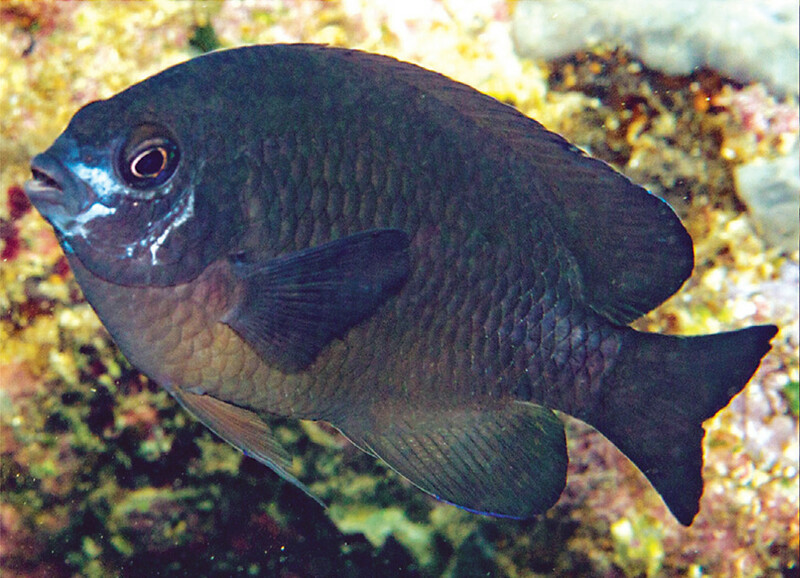 A unique ecological specialization and some geographic isolation have worked to produce yet another drab damselfish. Hurrah!